I am so thankful for friends. We are gathering for dinner at Aleta and Greg's for dinner early this evening. We had so much fun the first time we are doing it again. I am cooking the main course for the meal. I picked up baby potatoes in colors of yellow, purple and red, a sweet onion and baby portabella mushrooms. I gave them a bath and put them in the bottom of the crockpot. In a pan I browned the outside of a Sirloin tip using just a little Virgin Olive oil to seal in the favor. I sat the roast on top of the vegetables. Lipton Onion Mushroom soup mix is my favorite seasoning for the top. I added just a tad over a 1/2 cup water to the mix and put the lid on to let it slowly cook all day. 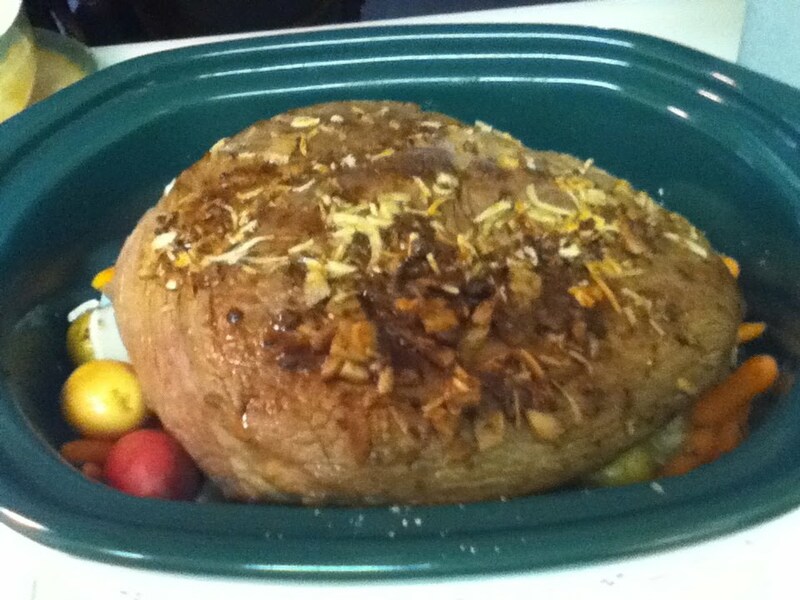 About an hour ago I cut up the baby Portabella mushrooms and sprinkled them over and around the roast and potatoes. We are down to the last hour of cooking and my house smells so good! Good food and good friends. Life is good. That looks so good I can almost smell it. I'd love to taste it. I've been hungry for pot roast lately so I think I may have to try your recipe. LeAnn it was delicious! Aleta made green bead casserole and sweet potatoes. Sally made a citrus rice dish and Carol made bread pudding. We felt like we had a thanksgiving dinner.